My good friend Susan Volland pointed out a mistake in the book before it’s even gone to press. Egad, the nightmare of every author. (And I’m not kidding myself that there won’t be others that don’t go discovered for a while….) Thankfully it’s a small error, more a clarification than anything. 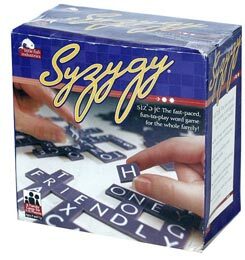 The only problem is that the game Susan actually plays is Syzygy. Essentially the same idea. Different style of tiles. No bright yellow banana bag. No Facebook page. Just the letters and those many thousands of words just waiting to be made! So I stand corrected. Susan is a manic Syzygyer. Not a manic Bananagrammer! Either way, she’s still a word nut.